CG HC Recruitment 2018. 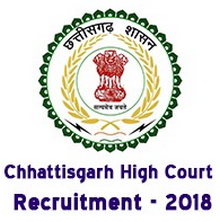 Chhattisgarh High Court has released a notification for the recruitment of Assistant, Software Engineer & DEO vacancies. Check the eligibility and notification prior to applying for the positions. Last Date for Submission of Application is on December 02nd, 2018. Minimum 21 & Maximum 40 years of age can apply for the Assistant, Software Engineer & DEO Posts. Relaxation in Upper age limit for those candidates belonging to other categories. The process for Selecting the Candidates for the said posts will be Interview Process. The Applying Process will be based on Online Mode for Chhattisgarh High Court. 2nd December 2018 is the last date to apply for the post. http://highcourt.cg.gov.in/ is the link to apply online.